There’s just something about luminous stuff. Whether it’s the lume on our dials, fireflies in the summer dusk, or glow-in-the-dark stickers, lume is something that I have truly been drawn to. 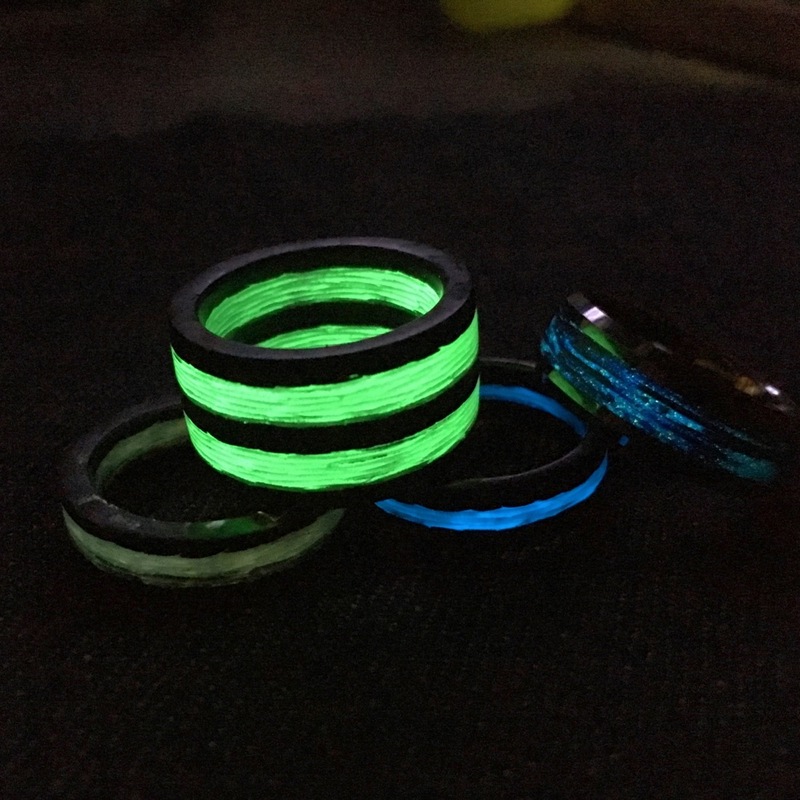 In the past few years, there’s been a seeming (at least, to me) of new makers popping up incorporating luminous materials into rings. The leader of that pack, in my book, would be Black Badger – he makes some amazing stuff, but it’s more what I’d equate to the luxury end of the segment (still, it’s on the “one day” list). So, what’s out there for us affordably-minded folk? That’s where you’ve got brands like Rune Refinery and Anilo Carbon coming into the mix. I’ve managed to pick up a few different rings from them, and thought we’d talk about them today. So, you might wonder, why not give each brand their own articles? Once you start paying attention to the companies making these rings (primarily from carbon fiber, with some other materials in the mix) you’ll notice that it’s a small community, and in some cases, the brands seem related to each other. In the case of Rune Refinery and Anilo Carbon, that’s a literal statement – we’ve got brothers at the helm of each. So, I figured it would be alright if we did a sort of group review. This isn’t the first time we’ve had either brand on our pages. Back in June we wrote about Anilo Carbon when they were Kickstarting their Triton ring. I jumped in on that project because, at just $35, it was an inexpensive way to get a little bit of lightweight glow on my finger. For that project, while there were a variety of colors available (in terms of the lume) I went with the white glow. I wanted to see how bright it actually ways, and since the glowing parts of the rings appear light and translucent anyways, thought I’d embrace the lighter tone. Now, if you’ve seen anything made from carbon fiber (automotive parts, watch dials and cases, etc) that’s not made from the “traditional” glossy weave, you know that carbon fiber can take a very interesting, almost crystalline, look. Don’t get me wrong – the top surface of the Anilo Carbon Triton certainly has the oriented stands of the weave present. On the sides, however, you get that crystalline look in how the light plays with the different angles of those cut fibers. It’s an interesting look for sure, and makes me glad that the proportions on this one are thicker. By that, I mean I went with the thinner width option from the project, and the ring is almost as thick as it is wide. A thinner ring would snug in a bit tighter, but given how narrow it is, my fingers got used to it pretty quickly. The white lume isn’t the brightest in the world (and Anilo is very clear on how bright colors are – or aren’t), but it’s a night bit of light in the dark. Now, the first time we were talking about Rune Refinery it was when I reviewed their Thin Blue Line ring (which is wider, but much thinner, than the Anilo Carbon Triton). With that purchase – and subsequent discussions with the brand – I got onto their mailing lists, which really is the place to be. You see, once you’re an established customer, you get word of new designs that are in the works, and what they’re thinking of making. Some of this is to gauge interest, as they can have certain material mixes made up. The advtange for the ring buyer is that, to ensure they’ll cover their costs, a small portion of the initial orders are steeply discounted. This is how I came to pick up the Rune Refinery Apollo 2X in Emerald Green. While the list price on the Rune Refinery Apollo 2X today (in any other various colors they offer) is $99, when I received that email that they were starting the material up, there was something like a 60 or 70% discount being offered. So, much like with the Triton, I thought I could not help but to take a chance on a wider ring like with what the Rune Refinery Apollo 2X is. And boy, am I glad I did. You remember how I was saying some colors of lume are brighter than others? Well, much like with watches, when it comes to rings, green is where it is at. When “it” is super-bright glow, that is. It’s crazy how bright it can actually get, and it’s made for some fun pictures. Some of those are here, and there are a lot more over on my Instagram page, including a rather interesting one where I had the ring at the bottom of a glass of carbonated water (check that out here). When you’re getting into a wider ring like the Rune Refinery Apollo 2X, fit and comfort are going to be a concern. In fact, the brand recommends ordered a 1/2 size up from your normal size just for that. From the Thin Blue line, I realized that, while my ring finger measures in at an 8.5, have a little more space (Rune took that one to a 8.75 for me) is just more comfortable. For the Apollo 2X, I took a gamble and went with just a 9. While some part of me wishes I had asked for the 9.25 on it, my finger has gotten more used to how the ring fits and sits. Regardless of the sizing, you will notice this ring, as it’s pretty wide – just about a 1/2”. What’s nice about the larger size – aside from the larger lume emitting surfaces – is that you can notice the ring glowing even in the light. It’s not enough that you notice the glow, but you can definitely pick up the green tint appearing in those translucent stripes. It’s an interesting way of getting the color popping in there. Oh, and I should also note, that the Rune Refinery Apollo 2X has the brand playing around with the finish of these rings. Normally, they’re done up to a very high polish, but here they’ve gone with a matte finish, and I agree that it’s a good choice for this ring. It gives it a solid, more casual, presence on the hand, it makes for a good, overall look. Now, on the other hand, if you want something that’s a good bit dressier, then we’ve got one more ring to talk about – the Anilo Carbon Odyssey. This is the first ring I’ve had from either brand that isn’t fully carbon fiber, and it quickly became a favorite of mine. Now, you might be asking why this ring popped in, as we had been talking about affordable rings. And, at a list of $189, the Anilo Carbon Odyssey is certainly a bit more spendy than what we’ve shown you so far. Well, remember those customer mailing lists I mentioned? Those same lists alerted me to a year-end clearance the brands were doing, so I took a flier on this one, as it was over an 80% discount that they had on it. Suffice to say, I am very glad that I rolled the dice on this ring. First off, it’s made primarily of tungsten, which gives the ring a gleam – and weight – that you simply do not see with the other rings we’ve talked about so far. Of course, the carbon fiber is not far away. Here, it’s set into a deep channel in the center of the ring, filled with resin, and done up to a polish. What you might not expect from a ring of this nature is that the carbon fiber is hiding lume! The blue is subtle, but it’s there. I’ve done my best to capture it in the photos, but it give an ethereal, smoky glow to things in the dark, and I rather dig the look. On the finger, there’s no denying there’s a heavier weight, but you quickly get used to it. The Anilo Carbon Odyssey has definitely become my go-to ring for dressier occasions, there’s no doubt.